Features: Latest colours in Dry Bar frame Designer finishes. Frame: 201 grade stainless steel Electroplated available in Brushed Copper and a Brushed Brass finish. Matching Table frame also available in 450mm and 540mm round designs. Features: Indoor and Semi outdoor use stool. Available while stocks last @ $110.00 inc gst. Frame: Steel Zinc coated and Powder coated. 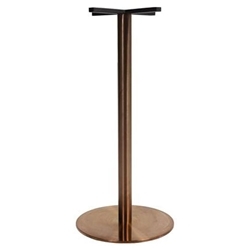 Commercial Vinyl seat pad available for the Stool at a additional cost.